Many people have been asking about how to make Puerto Rican coffee. This blend, also known locally as Café Con Leche, this coffee is considered to be a staple in Puerto Rican breakfasts. However, its great taste and its energizing kick make it a perfect drink for practically any time of the day. The great thing is that you can make this blend at the comfort of your home! 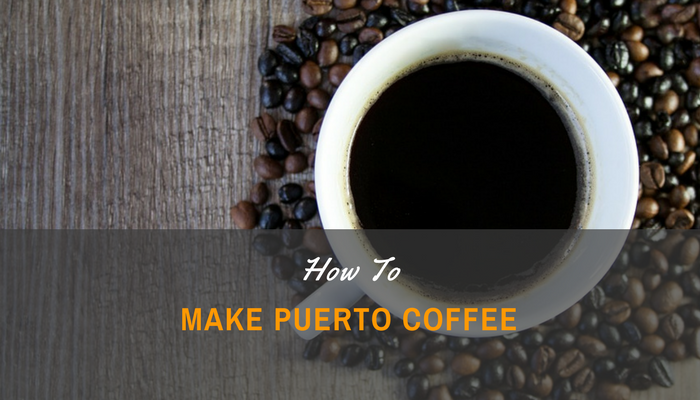 Here is the step by step process on how you can make Puerto Rican coffee at home. While you can use just about any kind of coffee, it is recommended that you go for freshly ground beans. You can’t go wrong with fresh coffee beans. It is also recommended that you go for stronger variants such as French roast. This will ensure that you get full strength, plus it complements this blend well. It is best to go for filtered water, as water with too much minerals or chlorine can adversely affect the taste. You can use tap water, as long as it is clean, tastes good, and its mineral content is not too high. The best way to determine if water is good for brewing coffee is to drink it. If it doesn’t taste good, coffee will not make its taste any better. The traditional recipe uses whole milk, and for the most part this is the best choice because of its creaminess and flavor. However, you can substitute low-fat or skimmed milk if you are trying to check your calories. As per usual, good-quality milk will yield good-quality Puerto Rican coffee. The traditional way of preparing Puerto Rican coffee is by using a colador. A colador is a traditional coffee maker that utilizes a triangle-shaped sock and a wooden handle. While it may seem too simple, this apparatus works pretty well, and is still widely used by traditional coffee makers in Puerto Rico and beyond. Plus, with this device, you won’t even need to use electricity to get your Café Con Leche done. Alternatively, you can also use a coffee maker to brew your coffee. Here is how to make Puerto Rican coffee with the help of a colador. Boil water in a non-aluminum saucepan over low heat. Add coffee once the water starts boiling. While there is no hard and fast rule on how much coffee you can use, the safe proportion would be to add 1 tablespoon of ground coffee per 1 cup of water. Adjust accordingly to how strong you want your coffee to be. While boiling your coffee, stir the mixture to avoid burning. As soon as the coffee starts to foam up, lower the heat and continue boiling for 1 minute. Turn off the heat. Stir the coffee for about 3 minutes as it cools down to ensure ample blending of flavors. You’ll need to pre-heat the milk before mixing it with your coffee. Heat the milk in a saucepan over low heat. As the milk heats up, make sure to keep stirring, as you won’t want your milk to form “milk skins”. Turn off the heat as soon as the milk approaches boiling point. Once you’re done mixing, strain the coffee through the colador into an empty cup or pot. You can then mix the milk. There are no rules to how much milk you can use for your Café Con Leche. The most common mix used is to ½ coffee: ½ milk, but you can also adjust the mix according to taste. You can use your choice of sweetener to taste. That is the basic technique on how to make Puerto Rican coffee at home. It is a simple recipe and yet it’s remarkably tasty. You should try making this at home right now!